On Friday, Nov. 5, no. 5-ranked field hockey rolled over no. 6-ranked Stonehill College in the NE-10 Conference semifinals, 3-0, at Bethpage Federal Credit Union Stadium. Sophomore forward/midfielder, Emily Miller, had a day to remember. She had a hand in each score for the Pioneers and earned five points in the process. The victory puts the team in its third conference championship bout in the last four seasons. All the scoring for the match came in a four-minute span in the second half, and that was enough. Miller notched the first goal in the 53rd minute, beating two defenders and the goalie for the opening tally. A few minutes later, Miller was back again; this time she was part of an odd-man rush that resulted in another goal. Sophomore forward/midfielder, Molly Cunha, assisted Miller on the mark, helping the Pioneers move one step closer to victory. Less than a minute after the second goal, the Pioneers added another goal. Sophomore forward/midfielder, Tarryn Morris, received a pass from Miller and sent her shot past the keeper to triple the Pioneer lead. Senior goalkeeper, Ericka Parks, earned another shutout victory, stopping all three shots that came her way. During the team’s current six-game winning streak, it has yet to allow more than one goal in a game and has allowed a grand total of two over that stretch. The Pioneers returned to action on Sunday, Nov. 6, in the NE-10 Conference Championship game against Saint Anselm College in Manchester, N.H. Earlier in the season, the Pioneers dealt Saint Anselm a 2-1 loss thanks to goals from junior defender, Grace Ilias, and junior forward, Kaycee Zelkovsky. The no. 3 Hawks from Saint Anselm must have felt like it was déjà vu, as the great Yogi Berra once said, as the Pioneers toppled them 2-1 again and claimed the NE-10 Conference title. Miller carried over her terrific performance from two days earlier and provided the fireworks in overtime when she fired a shot into the cage for the walk-off, game-winning, conference-claiming goal. Assisting on the tally was sophomore midfielder/defender, Julie Gysels. Miller was named the tournament’s Most Outstanding Player for her stellar two-game performance. Miller’s heroics almost were not necessary though. 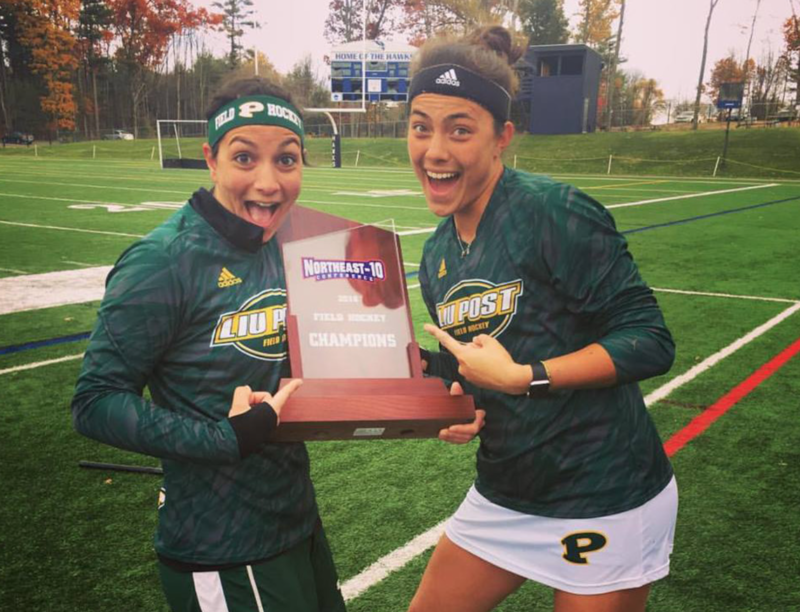 After establishing a one-goal lead in the first half thanks to senior midfielder, Steph Mocerino, the Pioneers held that advantage until the final seconds of regulation when Rose Mooney scored the crushing equalizer. The Pioneers, not rattled, settled down after momentum was snatched away from them and put the winning piece to the puzzle in the back of net just two minutes into the overtime session. For their role in the Pioneers run to Ne-10 champions, Ilias and Parks were named, along with Miller, to the conference All-Tournament Team. The Pioneers received a bye in the upcoming NCAA Division II Tournament and will play the winner of the Saint Anselm College and Stonehill College matchup in Easton, Mass. Head Coach Raenee Savin was excited about making the tournament and also about the opportunity the Pioneers have at a ring. “I’m confident in the work we put in and the focus we have. We continue to take it one day at a time and focus on winning the NCAA semi-final, but this team has a lot of NCAA experience, so it feels pretty good right now,” she said. The Pioneers’ semi-final game is set for Nov. 18.